The answer is......7! Take a look at this post for the answer. ...a definite 6, with a probable 8! I'm terrible at finding all the critters. The previous post is adorable. Love those baby teeth and the static in his hair! Thanks Kelly for playing along, do we have any more guesses before I reveal how many I think are in the picture? 7? 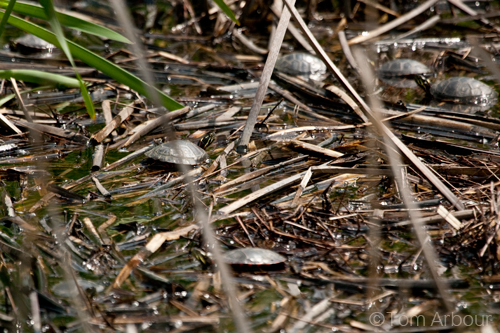 I hope you aren't tricking us and that they aren't painted turtles, but some other kind. I see 8, but my eye doctor's assistant used the wrong drops and my eyes have been dilated for two days. I'm just now getting back to where I can focus on the computer screen. I'll have to look again tomorrow to be sure. Photowalk this Saturday Morning at 'The Mac"
What Will Straighten Weston's Hair?